In the upcoming animated film Wreck-It Ralph we follow Ralph on an arcade-hopping adventure. 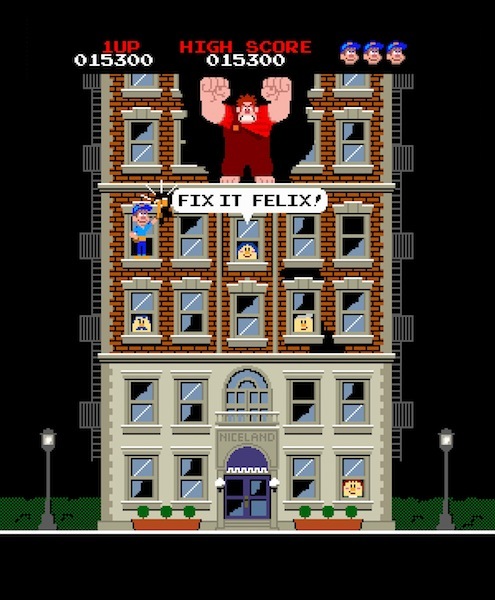 For 30 years he has been stuck playing the bad guy and being overshawdowed by the good guy “Fix it Felix” in an 8-bit game. One day he decides enough is enough and takes matters into his huge hands and sets out to become the hero. This film of self exploration in quest to be a better person is something everyone will be able to relate to. When all the odds are against Ralph and things seem impossible he keeps moving to a different video game. At first he encounters defeat, a tough-as-nails sergeant, and war-infested with big bugs in an action game called Hero’s Duty. When that doesn’t work out for him, he makes his way over to my favorite video game — the delicious Sugar Rush Land. A game where everything is candy sweet. Visual developement artist “Lorelay Bove” tapped into her Spanish roots and her LOVE of Antoni Gaudi to help influence the style color and character design for Sugar Rush. A swirly mosaic sweet landscape that would be melt-in-your mouth edible. I was taken by this portion of the film and wished I could be a gumdrop amongst the ice cream, cookies, cake and cotton candy. This is also where Wreck-It Ralph finds his first real friend in the movie. I won’t go into further detail about the film, but I will say Disney has definitely hit an all time high score with this video game escapade. It will have mass appeal, attracting various generations of gamers to a theater November 2nd. I will be one of the first in line to savor it again. 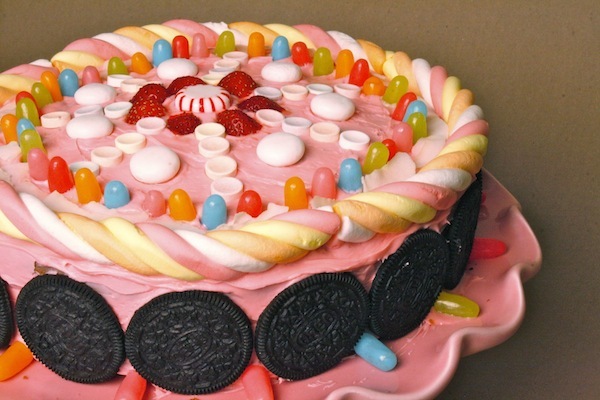 Here is a Sugar Rush inspired cake I made to hold me over till the movie hits theaters. Start with two cake rounds. 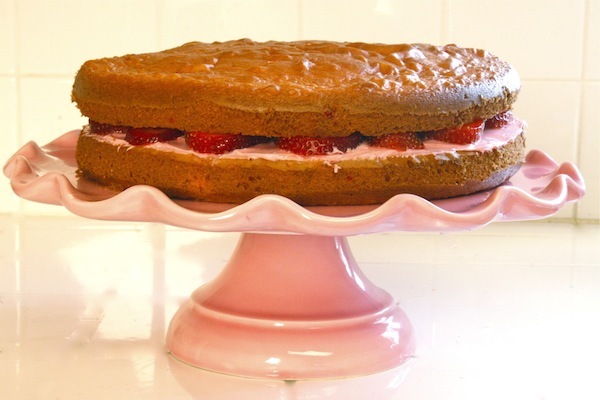 Frost the top of the bottom layer then carefully place strawberry slices on top of frosting. Next top with second cake round to sandwich frosting/strawberry layer. Now frost entire cake. 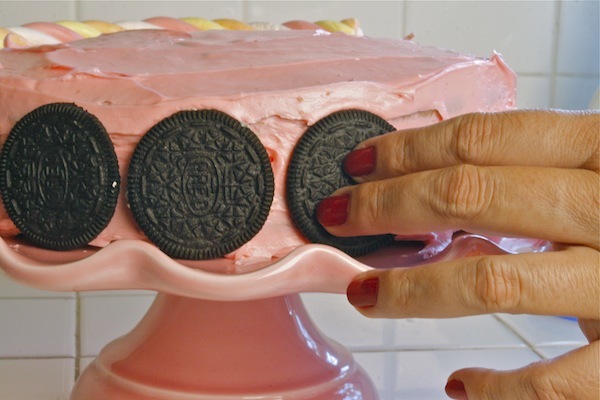 Take one side of an Oreo cookie and place all around the edge of cake. Then I topped the cake with marshmallow ropes to form a complete circle. Next I took coconut shreds and formed a circle inside of the marshmallow ropes. 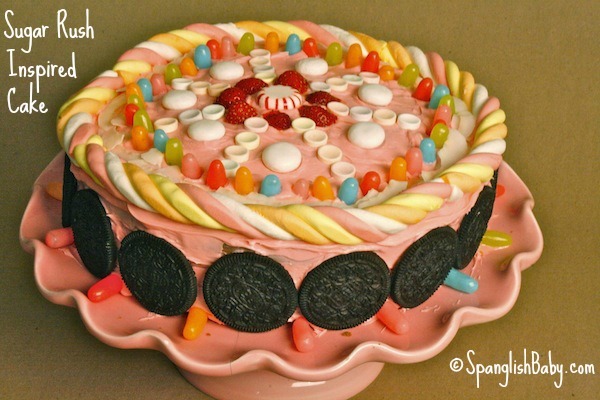 Then anpther circle was formed on the inside of the coconut shreds with Mike And Ike candies, and I kept decorating till my cake looked like a wonderful fantasy animated candy encrusted cake. WRECK-IT RALPH smashes into theaters on November 2, 2012.